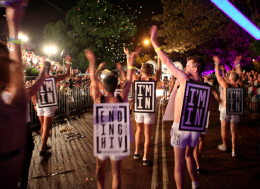 As Frost*collective rolls out the fourth instalment in its ‘Ending HIV’ campaign, directors Vince Frost and Ant Donovan reflect on the evolution and longevity of the project. When first pitching for this project in 2012, we were very mindful of the longevity of the campaign, and the importance of it being simple and timeless – changing slightly, but always maintaining its overarching messaging and identity. In the beginning, the brief was to use explicit language, as this was seen as being the best tone to communicate with the audience. 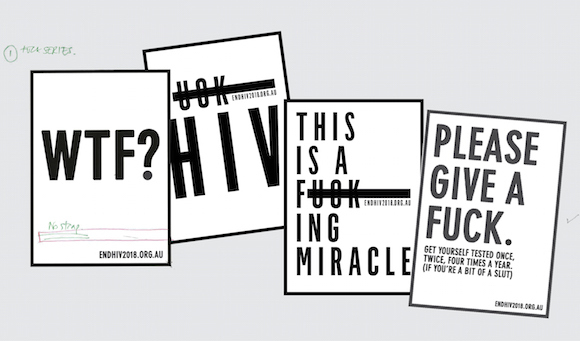 When ACON (Aids Council of NSW) said to us that we could end HIV by [the original endpoint of] 2018 we kind of thought, “Well, that’s a f***ing miracle,” and so we had this whole ‘f***ing miracle’ slogan, which had a double meaning. We had a lot of fun with this at the studio, though it didn’t test very well. It worked well as an idea, though it was seen as too offensive to be out in the streets of Sydney, where the whole population would see it. 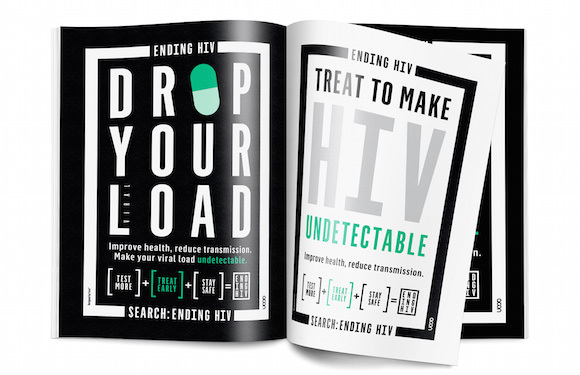 We went with the equation ‘Test More + Treat Early + Stay Safe = Ending HIV’, which is exactly what the messaging is all about. This latest message is a very targeted one. 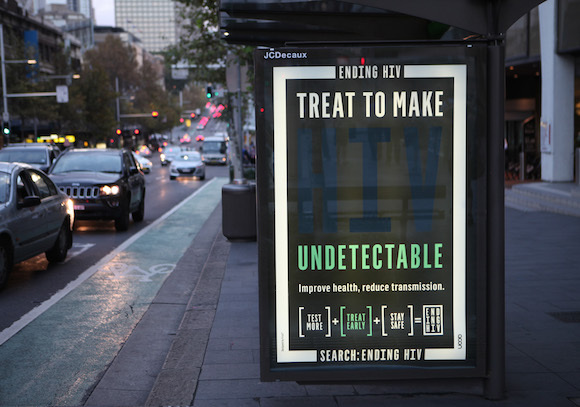 Through all the research undertaken with LGBTI communities – asking about their lives, the language they respond to, what would be annoying, encouraging, hopeful – ‘undetectable’ was seen as the best catchphrase for this stage of the campaign. It became the word we were told to latch onto as it was already in use by the community. It’s a word that’s out there in the vernacular and, for the people who don’t understand the term, the goal was to inform them (it’s clearly supported by the line underneath, ‘Treat early to make HIV undetectable’.) In terms of messages this was easily the most complex of the stages. Strategically, it was the most sensitive, because it’s not just a case of ‘treat early and you’ll be OK’ – it’s more involved than that. The phrase went through one or two concept presentations and testing, but the word ‘undetectable’ stayed constant. Through all the campaigns there was an emphasis to not create fear. The brief was not to go the grim reaper approach, used across AIDS public messaging [in 80s Australia]. This worked at the time, and while each of the campaigns we created is supposed to be confronting to a certain point (we’re not beating around the bush), HIV is part of our world and this messaging is more about being helpful and informative, and lifting the confusion around HIV. That’s the objective. 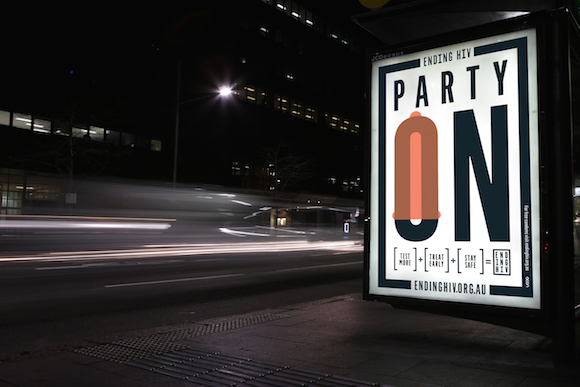 With each campaign we try to find something short, sharp and very impactful, and having a mnemonic integrated into each of the messages has been hugely successful. There’s real strength of recognition in what we’ve created so far. Maybe recognition is boosted when it’s a social issue; maybe it resonates more. The campaign is becoming part of a wider communication toolkit, with other states utilising it too. There’s a lot of clutter out there on the streets; a lot of advertising that comes and goes, plus a lot of graffiti and whatnot. 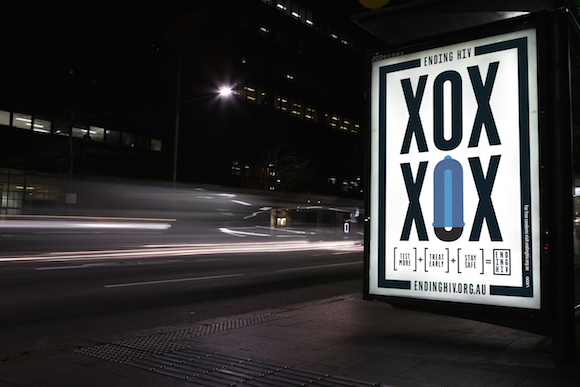 So for us it’s very important that we are distinctive in our messaging, and in our creative execution of that. It’s a case of less is more. The beauty of creating this out-of-home media from scratch was that its purpose was to be bold and direct, and wasn’t dictated by using certain colours, fonts or logos. The look and feel of the project was taken from the campaign-driven statement T-shirts of Vivienne Westwood and Malcolm McLaren in the 70s and Wham! in the 80s, as well as ‘The End is Nigh’ sandwich boards – picking up on the simple, bold messaging used to get these complex ideas across to the public. In the market there tends to be trends, whether that’s a certain style of photography, illustration or typography. You can see in the zeitgeist there are things going on that are similar in their look and feel across different communication platforms. I think this campaign is kind of different right now. If black and white typography on posters becomes popular in these kinds of campaigns, then we’ll have a problem. We’d have to rethink a way to make it stand out again. 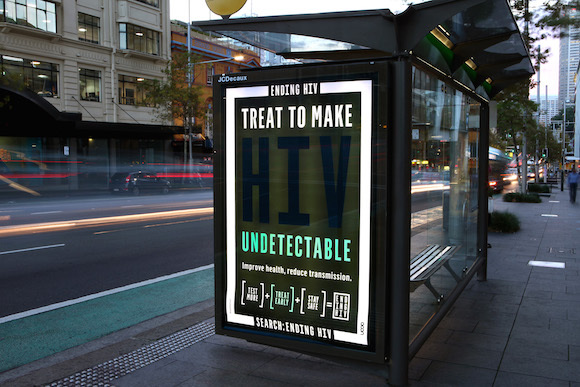 The ‘Treat to make undetectable’ phrase is executed [in the design, too], with HIV presented in a hard-to-detect colour. Originally [this feature] was more subtle, but the client insisted we make it a bit more legible. It needed to work during the day with all the reflection on the Perspex on bus shelters and at night with a light behind it, so that ended up being the thing that was the most perfected and gave the result we were after. It’s not that technical. It ended up simply being gloss black on matte black. [Creating these kinds of campaigns is] not just graphic design, which is a terrible term. It’s more than just typography on a white piece of paper – it involves effective strategic, business advice. More than creating an aesthetic, we want to create a stimulus for the target audience so they can understand the communication. Whenever we design, we’re not designing for ourselves. We’re not doing it for our portfolio or our own sense of gratification. Instead we figure out what would be the best solution for our client. Any great piece of work is only as good as the client’s investment, and their understanding of the values of good design. ACON was incredibly encouraging with what we created. Being a government-funded organisation, it doesn’t have a huge amount of money, and so the success was around the breadth of what we could do for a lot less than what a typical advertising campaign has. 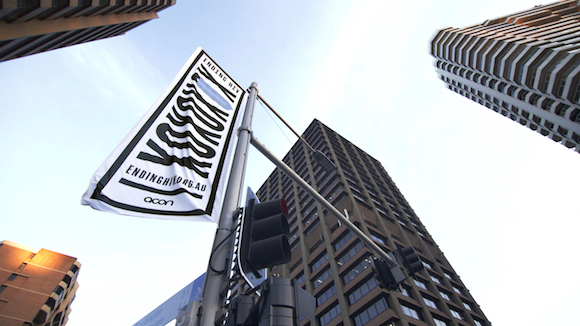 The strategic planning around the execution was key: the continued investment and presence in the streets and in clubs, the pop-ups in places like Taylor Square. It’s very much a team effort. We gave ACON the tools to communicate with its audience on a long-term basis. The recognition factor is around 70 to 80 percent, and the effectiveness and recall grows with each campaign. We approach social work, corporate work and commercial work exactly the same. Each case is about getting clarity in the brief, digging deep into the problem or opportunity and asking more questions than the client is usually prepared to give answers to. The more we know, the better the solution. We have to understand what success looks like to the target audience, and then it’s our job to achieve that. We’re incredibly proud and honoured to be on this journey with ACON, which is well on track to achieve what it’s trying to do. We want to do good in the world. We are determined to design success and we are passionate about helping others live a healthier, happier life. We’re very much in tune with this, and excited that we’ve actually helped change perceptions or social behaviours. All images courtesy of Frost*collective.